As you can see on my blog, I love doggames, and I can't help it, but every time we are at an event or show, I must go see those games, and almost all of the time I buy one. So my score of games is pretty high at the moment. But why are those games so much fun?? Well every dog has a certain purpose, or job. My dogs the collies used to be sheepherders, and my borzoi a hunter. But in normal daily life I do not hunt wolfs and I don't own a flock of sheep, so I cannot do job with them, wich they where bred to do for many, many centuries. Now I know I can go to a coarse and go coarsing or racing with our borzoi, and I know I can do sheepherd training with my collies, but it is just not my cup of tea. I do train with my dogs but I love dogshows so that is merely showtraining I do. And the dogs love it too, really, they are working with me, I ask them to stand and the Judge to go over them, so that is kind of work for them, but after a while it is a routine for them, so they need a new challenge. I only can think that bored dogs are not happy dogs. And with those games you will stimulate their brains, you can somethimes really see how they are trying to figure out a puzzle to get to their treats. So actually they are "solving a problem" and they are getting a reward for it. Ofcoarse you have to start with easy games, otherwise I think the dogs can get annoyed and don't like to play games anymore. But I really see a nice change of behaviour since I started with those games. It absolutely is "NOT" a replacement for daily walks. We like to meet people, and we like to check our Facebook and Twitter accounts. A dog cannot do that, so their daily walk is not only for doing the duties, but certainly a way of knowing what is going on in the outside world. But after a walk my dogs are maybe a bit tired fysically, but mentally they are not challenged by walking alone. That is a reason I give them the games and puzzles, just to keep their mind and body in shape. 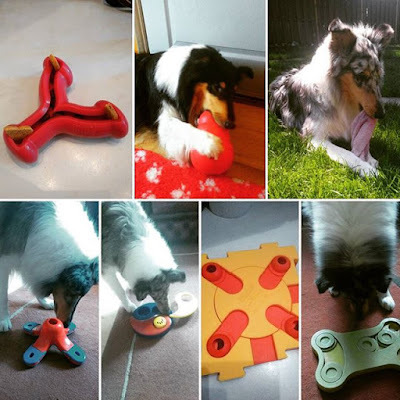 There are many toys, games and puzzles on the market in all kinds of price ranges, and you can easily make them yourselve, just hide your treat somewhere and start playing with your dog, It's big fun I promise.